Hello everyone: I have a very non traditional Christmas card I made for "Precious", which is one of the two kitties my grandchildren Vanessa, Gabriel and Anastasia have. She is gorgeous, jet black and moody, oh my goodness!!! she is moody. Very quiet, doesn't like to be picked up, petted, woken up, she usually is in her cube which is in one corner of the family room or sitting in the ledge of the living room window taking some sun. This stamps from Katzelkraft could have been designed with "Precious" in mind, the set's name is Les Furieux. 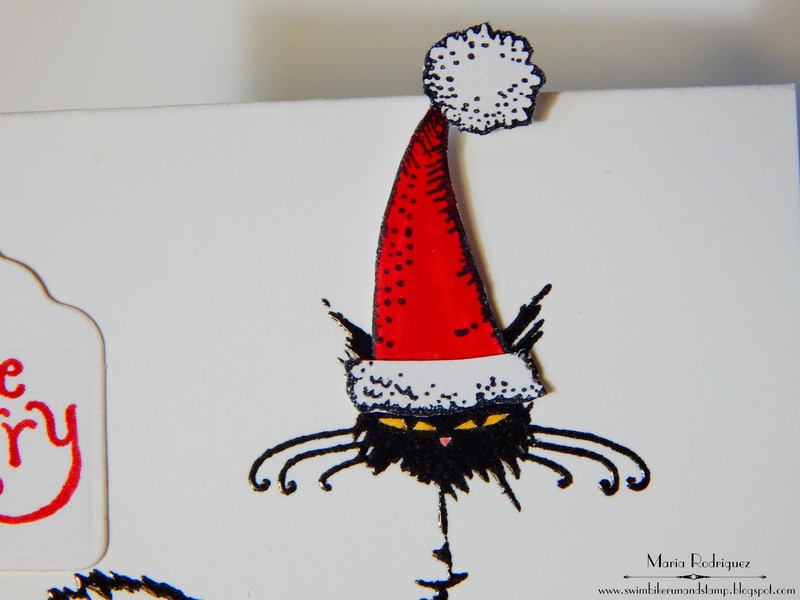 I don't think any of my grandkids would dare put a Santa's hat on her so I thought I would do it on this card. I got my inspiration from the Muse: Christmas Visions challenge and this card by Cornelia Wenokor. 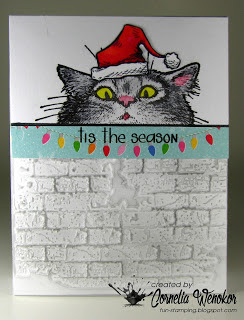 I stamped my Kitty on a Neenah Solar White card base with Versafine Onix Black ink several times to get a nice even coat then, I clear heat emboss it. 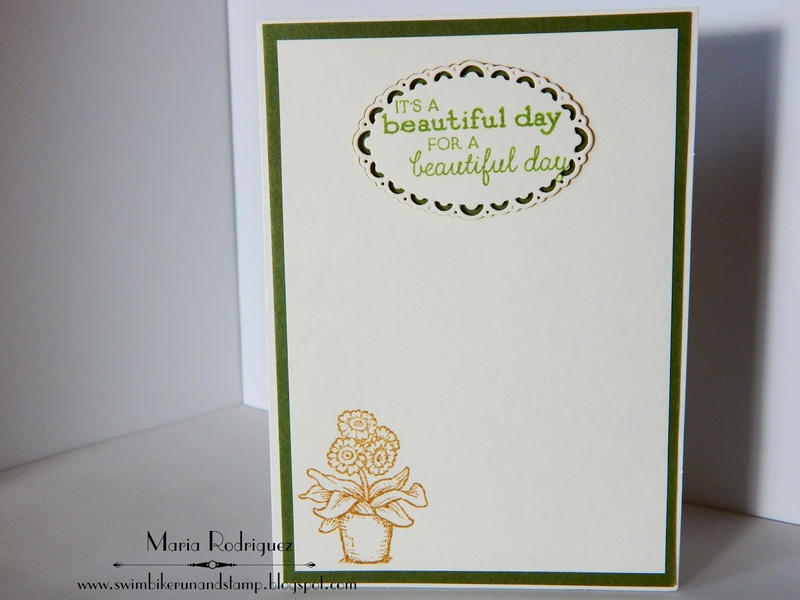 Clear embossing powder is my favorite one, I use it very often. The "Santa's Hat" was done using the hat, one of the images from a set by Power Poppy called Merry Littles, I stamped the hat on a scrap piece of paper and then fussy cut just a portion of the top and the very bottom, to make it fit on my panel, the puff still sticks out of it but non the less, fits in the envelope. I put a couple of glue dots to adhere it to the kitty's not so happy face. There are a lot of ways to interpret the look on her face. The sentiment is from Power Poppy's Poinsettia, the mitten from Merry Littles. Muse Christmas Visions 78, Cornelia Wenokor's card is at the top. 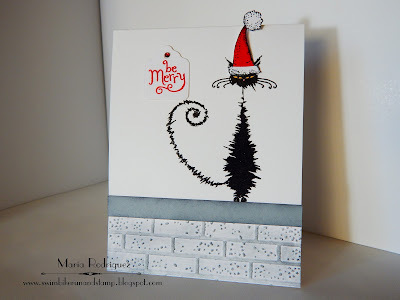 Sweet Stamping Christmas "Anything Goes Christmas"
Cardz for Galz Challenge #42 "Name your Powder" My favorite embossing powder is clear, I use it instead of colored embossing powder with pigment inks, you don't have to worry about stray specks of colored powder on your projects. Little Miss Muffet Challenges #158 "Anything Goes"
Crafting with an Attitude Challenge #25 "Anything Goes"
Hello everyone: I've been kind of busy this past couple of days with my DH (dear hubby) on brake till next Saturday, plus I'm the taxi service for my grandchildren and now, I'm helping my beautiful almost 19 year old granddaughter Vanessa, shop and prepare some Vegetarian meals. I don't think I could become a total Vegetarian but let me tell you, this salads, soups, main dishes, desserts are amazing and incredibly healthy and easy to make, the ingredients are easy to find so, since I also love my veggies, I've been preparing enough for us too. Ok, but I digress.....I have a really cute card to share with you that I will link to the LiveLoveCards March Challenge "Cards for Kids" plus a few other challenges, at the end of this post. 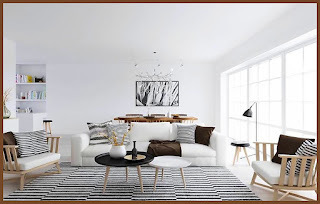 This super sweet image is from Lili of the Valley but it's sadly discontinued. 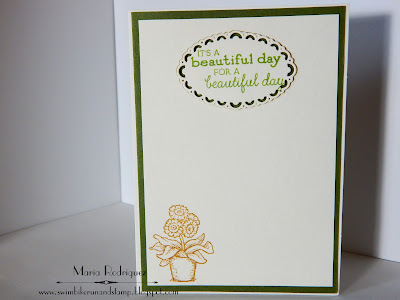 I stamped it onto a panel of Strathmore mixed media paper with Stazon black ink and colored it with my Stampin' Up! markers and an aqua painter, I sponged a bit of Tumbled Glass distress ink for the sky. 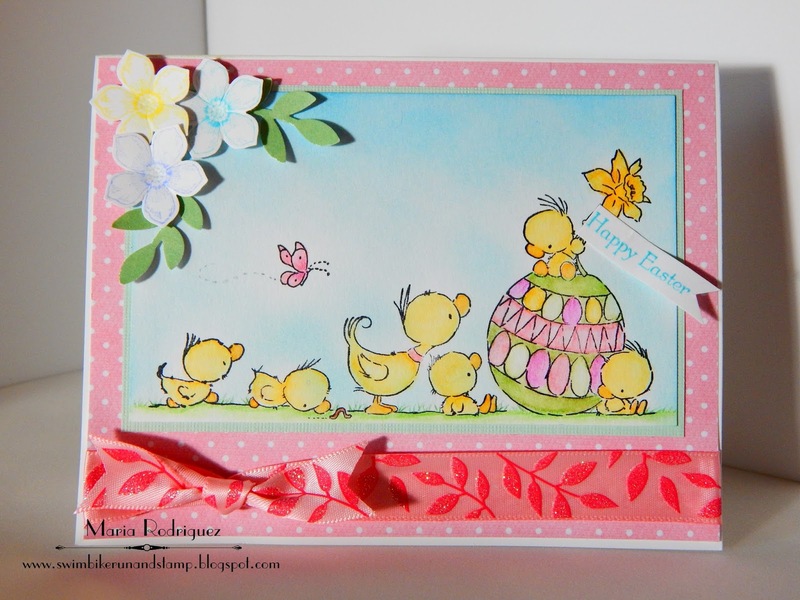 The little flowers on the corner are stamped and then punched with the Petite Petals stamp set and coordinating punch from Stampin' Up!, the little banner the ducky is holding was stamped with the Teeny Tiny Wishes and the leave on my flowers were punched with the Bird Builder Punch. 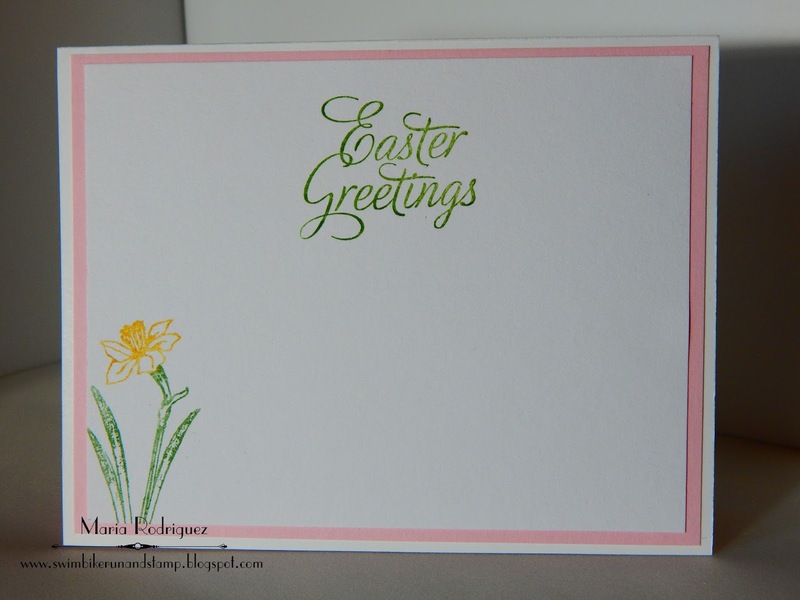 The sentiment and Daffodil are from old Flourishes Easter sets. LiveLoveCards March Challenge "Cards for Kids"
The Crazy Challenge #243 "We Love Animals"
Come and Get It Challenges "Cards for Kids"
Addicted to Stamps Challenge #143 "Pastel Colors"
Scrapbook Stamp Society Challenge #111 "Anything Goes"
Hello and welcome to a new challenge over at SHOPPING OUR STASH, this time we want you to use a Crackling medium. I must confess that I have never, ever used anything remotely resembling this stuff, I tried to buy some but I couldn't find a small bottle or jar of it, only big spray cans with tons of instructions on how to get the "wore out" look on furniture so, here comes GOOGLE to save me from not being able to contribute a card to this challenge, which was driving me nuts. I found several videos on how to make your own crackling medium and, after watching some of them THIS ONE seemed easy enough for me to try. So here is my card, hope it's ok. This crackled panel was the best of the batch I made, this morning I came to see if they were dry and two of them had fallen on the carpet and gotten full of fuss, 😠!!!!! from the 3 left I picked this one for my frame, the other two were not crackled enough. After die cutting it I put it aside and concentrated on what to "frame" with it so I picked this image from an old Flourishes set called "With Gratitude". I stamped the image onto a panel of Strathmore mixed media paper with Stazon black ink and colored it with my Prismacolor pencils, I didn't use the baby oil this time I kind of wanted it to look like a real painting. I added a few NUVO Translucent Jewel Drops in Lavender. 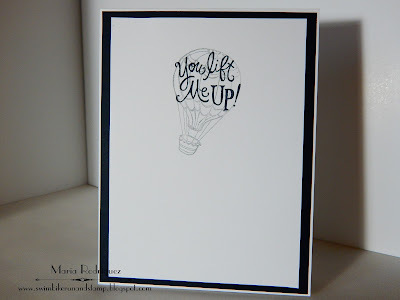 So I hope you found some inspiration from my card to give the Crackling technique a try and join us in the gallery of SHOPPING OUR STASH, for more inspiration, hop over the blog and check out my teammates awesome cards. Thank you for stopping by, I always read every single comment you so kindly leave on my posts, I want you to know I appreciate each one more than words can express. 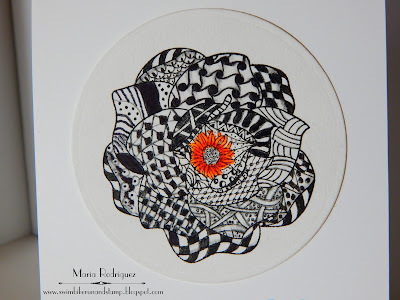 Hello everyone: Some time ago, while browsing Pinterest, I discover the art of ZENTANGLE, which takes doodling to a whole new lebel. I was intrigued by the intricate designs on this awesome images and, as it often happens with something that tickle my curiosity, I went and Google'd it only to find a ton of blogs dedicated to this ultimate form of Doodling. 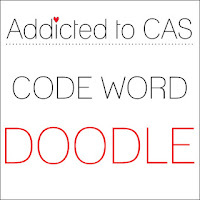 I went ahead and bought a book, ZENTANGLE BASICS, which is really super cool. 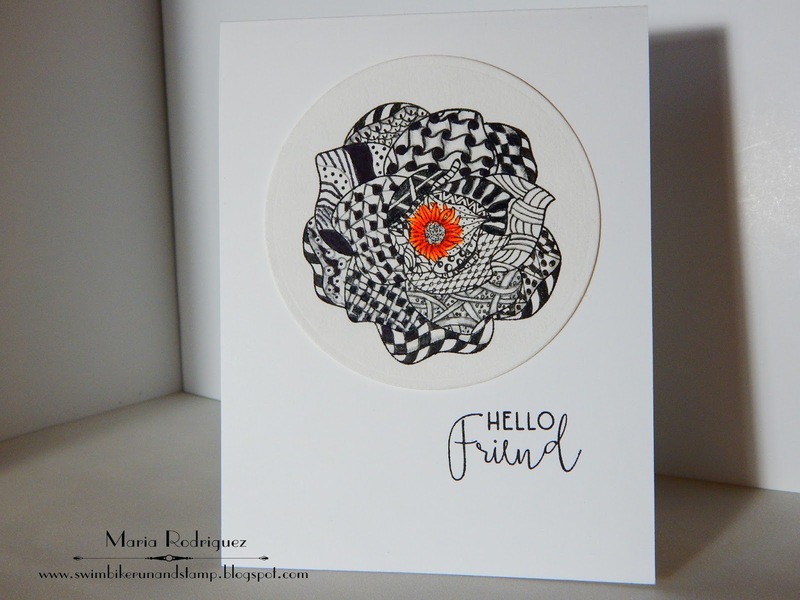 In spite of what might appear as very complicated doodling, it's quite relaxing and surprisingly easy to do so, here is a card that was inspired by several challenges that I will link to at the end of this post. 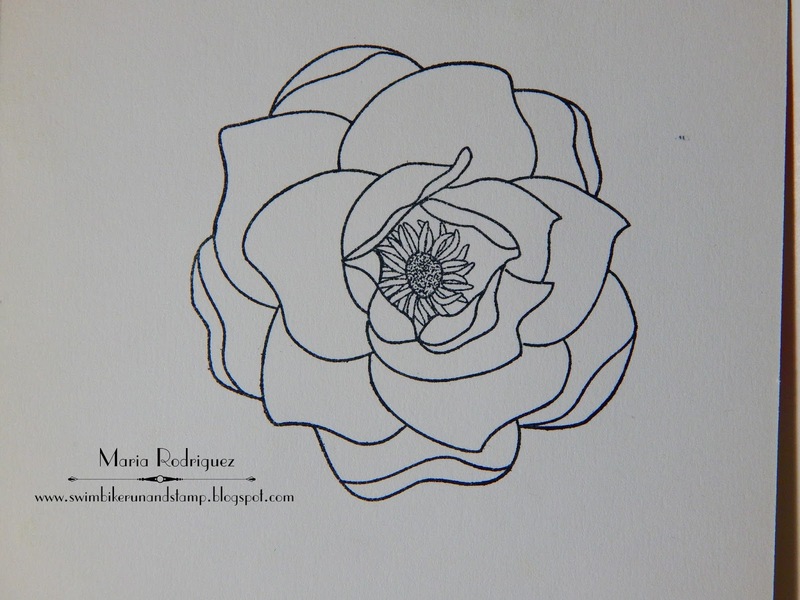 This flower is from a stamp set by "The Cat's Meow" called "Beautiful Spring", I chose it because of the nice space provided by the petals, here is a picture of it before I started doodling on it. Quite a change, don't you think? I went to my book to look for some designs and I just doodled away. 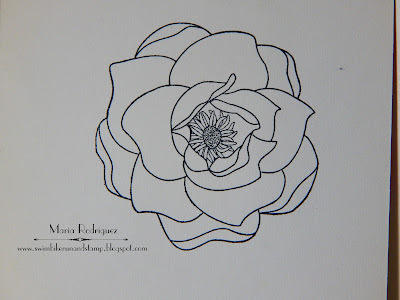 I decided to make the center of the flower more vivid, I thought that by going with the black pen on this tiny strands would make them disappear, I really like the way it looks like this. Here is a close up of this Zentangled flower. I hope you can still see each little petal. 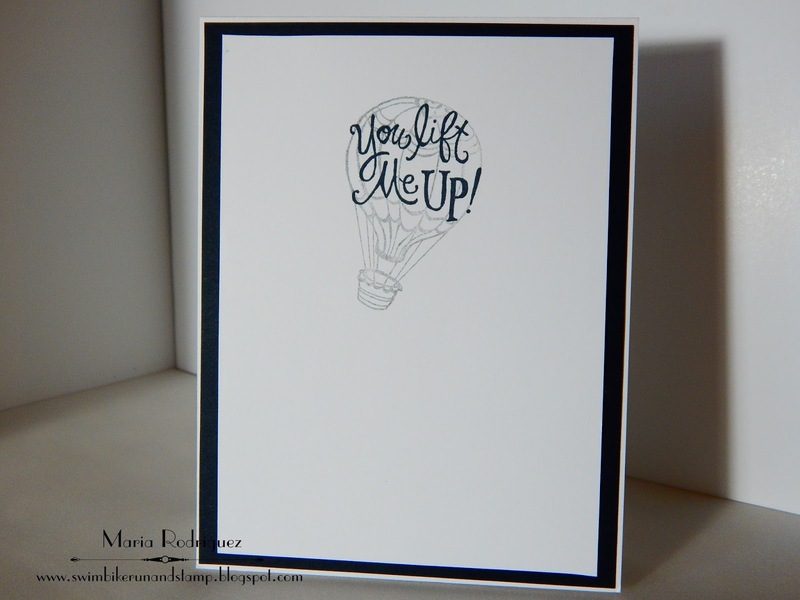 Both the sentiment and the Hot Air Balloon are from an old Flourishes set called "Lots of Thoughts"
Addicted to CAS Challenge #106 "DOODLE"
Alphabet Challenge "Z" for Zero Embellishments. 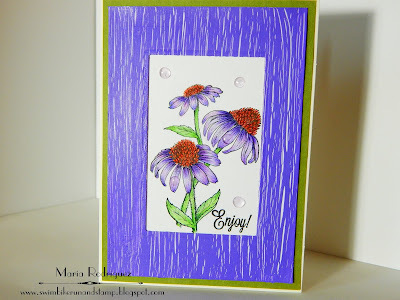 Dragons Lair Designs Challenge "March Challenge" Anything Goes/optional twist "Spring Flowers"
Daring Cardmakers March Elemental Inspiration. Brown Sugar Challenge #240 Anything Goes.